In 2002 international aid coordinator, Johnie McGlade, had just returned from Afghanistan where he had overseen the building of a bakery in a displaced persons camp. There he’d seen thousands of Afghans who had fled from the American bombings spawned by the tragedy of 9/11 and there he witnessed many injuries (mostly to children) caused by landmines. For years Johnie had taken a ratty, old puppet named Seamus with him wherever he went because he found it incredibly useful in attracting and engaging children. When Seamus finally started to fall apart, a friend told him that her Aunt was a puppeteer and could fix the puppet. That Aunt turned out to be Kathryn Mullen a long time puppeteer for the Muppets and, as luck would have it, she was married to Michael K. Frith who had been Art Director, Designer and Head of Creative Services at the Muppets for over 20 years. But Johnie didn’t ask Kathy and Michael to fix his puppet, instead he asked if they would create a puppet show to teach Afghan children how to stay safe from land mines. They said, yes, and the idea for No Strings was born. 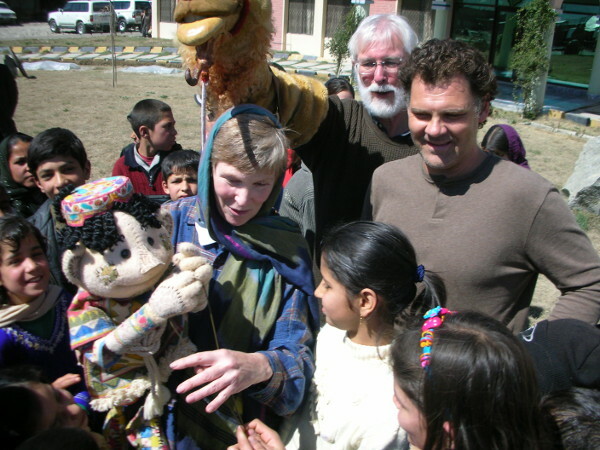 Later, Kathy and Michael founded No Strings Productions to produce the puppet media and Johnie founded No Strings UK to do the fieldwork and outreach. Since that time, in partnership with funding organizations such as Ireland’s Trocaire, CRS (Catholic Relief Services), Plan International, JRS (Jesuit Refugee Services), Save the Children , Caritas, World Vision and Oxfam, No Strings has produced 15 short videos that have been dubbed into 24 languages and distributed in 13 countries.